Saturday night marked the final social event of the United States Equestrian Federation’s annual meeting and the announcement of the Farnam/Platform USEF Horse of the Year in Louisville, Ky.
Five horses were up for the prestigious award, but it was show jumping champion Authentic who took the prize. A lengthy standing ovation erupted when Chris Jacobi, president of Farnam’s Horse Products Division, declared Authentic as the winner. Beezie Madden, who rode the 11-year-old Dutch Warmblood gelding in international competition, was visibly moved. 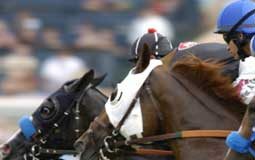 One night earlier, Madden had been named the 2006 USEF Equestrian of the Year. Together, the pair has had whirlwind success with an amazing medals haul. It began in 2004 when Authentic and Madden wowed crowds at the USEF Olympic Selection Trials and proceeded to star for team USA in the show jumping competiton at the Olympic Games in Athens, Greece, and culminated in 2006 at the FEI World Equestrian Games when they took home the individual silver medal and contributed to the team silver. Authentic, owned by Abigail Wexner, was selected by the votes of the USEF Board of Directors, members and media. In addition to prestige, a 39-inch bronze sculpture will be on permanent display at the USEF headquarters in Kentucky. A bronze replica was presented to the owner and the four finalists received crystal trophies. 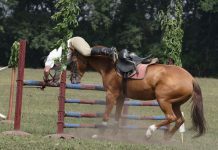 For more information about the Farnam/Platform USEF Horse of the Year program, visit www.usef.org. I love Beezie and Authentic, and are very happy for the both of them. You guys rock :)!! i am so glad that Authentic won. he is such a great horse. his owner must be very proud.